The Drug Enforcement Administration (DEA) is warning the public about the dangers of designer synthetic drugs, also referred to as New Psychoactive Substances (NPS). These substances have no legitimate industrial or medical use and the misuse and abuse of these substances represents an emerging and ongoing public health and safety threat in the United States. Law enforcement has encountered over 300 NPS, the most prevalent being synthetic cannabinoids and synthetic cathinones. The manufacture and distribution of these dangerous substances may result in a prosecutable offense. 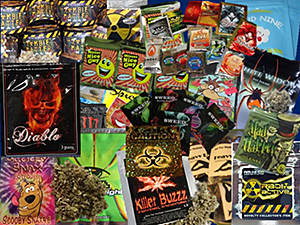 Synthetic cannabinoids are substances that have been encountered laced on plant material and in liquid form and misused and abused for their psychoactive effects. They are often sold under names such as Joker, Green Giant, Scooby Snax, and many others. The misuse and abuse of these substances may result in serious adverse health effects including severe agitation and anxiety, racing heartbeat and high blood pressure, intense hallucinations, and psychotic episodes. Synthetic cannabinoids have also been connected to overdose deaths. These products are generally sold over the Internet, in head shops, tobacco/smoke shops, convenience stores, and gas stations and are often packaged in shiny plastic bags with bright logos. Synthetic cathinones have stimulant properties related to cathinone, the psychoactive substance found in the khat shrub, and produce pharmacological effects similar to methamphetamine, cocaine, and MDMA, to name a few. They have been sold as “bath salts”, and sold over the Internet, at convenience stores, tobacco/smoke shops, and gas stations and packaged in shiny plastic bags and bright logos. More recently, the cathinone market has been pushed underground, and is being sold in “traditional drug packaging” like little baggies, and can be found in tablet, capsule, or powder form. Users can experience symptoms of nausea, vomiting, paranoia, hallucinations, delusions, suicidal thoughts, seizures, chest pains, increased blood pressure and heart rate, and violent outbursts. These drugs have also resulted in overdose deaths. A recent synthetic cathinone product encountered is Flakka; sometimes called Gravel. Flakka is sold as a street deal, like other illegal drugs, not in stores, and can be sold in capsule form or in small baggies. Laboratory analysis has identified the Schedule I controlled substance alpha-PVP in some of these encounters. Synthetic phenethylamines, which mimic hallucinogens, have been encountered as powders, liquid solutions, laced on edible items, and soaked onto blotter papers. Two of the known street names are N-bomb and Smiles. Like Flakka, phenethylamines are not sold over the counter and are sold like other illegal drugs. The ingestion of extremely small amounts of these substances may result in seizures, cardiac and respiratory arrest, and death. The DEA continues to monitor and respond to the emergence of new synthetic drugs to protect the public. To help DEA combat this threat, the DEA is asking the public to submit information via the online form.